Look! Here's Middle shortly after landing in Denver yesterday. This photo is important for several reasons (aside from the fact that I have NOTHING to write about without it)...let's discuss. First of all: isn't he a darling boy for letting me know he arrived safely? I didn't even TELL him to text me when he landed. I'm patting myself on the back here for raising him right/correctly/to cope with my anxiety levels when he travels. Let's remember, the only things I actually TOLD him to do was wear sunscreen in Death Valley and stay hydrated. And what does he have in his left hand in the picture? A BOTTLE OF WATER. I tell you, the child is a genius. 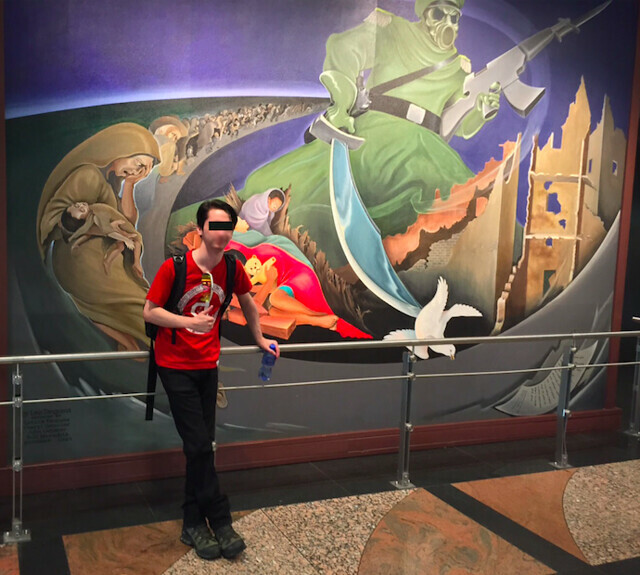 As for the location of the photo, he's in front of one of the unbelievably creepy murals they have in the Denver airport. You should google Denver's airport. It's a fascinating place. Yes, that is the angel of death with an AK47. Yes, those are weeping women with dead babies. Yes, yes, the letter in the bottom right of the picture was written by a 14 year-old who did not survive the holocaust. These are all exactly the kinds of things one wants to see before boarding that long flight, aren't they? I don't expect to hear from him much (and I don't text him when he is working as he texts back "WORKING") but he did call last night to tell me something funny and I asked if he ate (yes, a burger) and if his hotel was "fancy" (yes, The Magnolia) and if we can just get me through that part with the helicopters I think I'll be okay. Holy Creepy Mural. That is one awful scenw! Water, photo. He's a gem. I think I'll text a link to this post to Young Master Buxom, who has been in Vermont making a movie for a week and has gotten in touch via text maybe four times. I'll forgive the paucity of texts at the moment, because he's in the middle of nowhere and can't get a signal, but NO EXCUSES ACCEPTED for not texting me when he landed at the airport. Where was he raised, in a barn or somethi---oh, wait. That is some weird airport decorating. Wow. 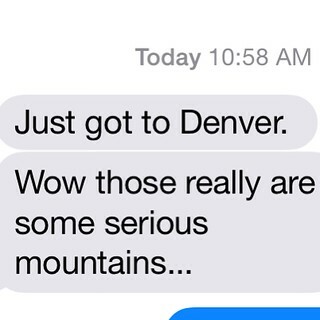 I've been through Denver but not through that gate I guess! Glad he made it there in one piece. I'm sure he'll come home the same way. A grown child that texts back WORKING is to be treasured. Mine just don't. Text back, that is. Did you notice the angel of death is goosing the bird of peace with his sword?